The Davis’ kick off Black History Month with Reverend Jesse Jackson. Yes, Seattle Rev. Jackson is a Seahawks fan!! 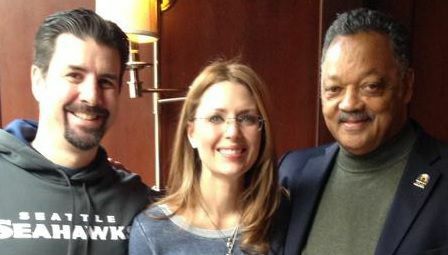 While in New York for the Super Bowl, Chris and Mischelle Davis were thrilled to be able to enjoy some one-on-one time and a cup of Starbuck’s coffee with the Reverend Jesse Jackson on February 1st. Is there any better way to kick off Black History Month? Reverend Jackson shared anecdotes and memories of his many visits to the Seattle area and the special moments that he has had at the Mount Zion Baptist Church of Seattle. Rev. Jackson also asked Chris questions about his law practice, some of the firm’s more notable cases, etc. Rev. Jackson and Mischelle discussed a shared experience at Atlanta’s Ebenezer Baptist Church in Atlanta in the mid-1990's and their mutual admiration of the church’s world-famous choir. Incidentally, Rev. Jackson also confirmed that he is a Seattle Seahawks fan and would be a member of the "12th Man" during the Super Bowl.